UPDATE: The dates have changed; noted below. The schedule has been announced; it is pasted at the bottomm of this post. 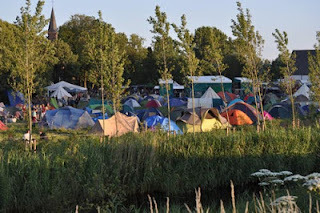 From 22 to 25 July this year, the free city of Ruigoord will hold their 3rd “Futurological Symposium on Free Cultural Spaces.” This coincides with the opening of the embassy of Christiania, the sister free city in Copenhagen, and a 40th anniversary celebration of Ruigoord. From the 26th to 29th, the community will host the annual Landjuweel festival. If you are interested, please contact: ruthbader@hotmail.com with a cc to: symposium@ruigoord.nl. Organizing committee: Rudolph Stokvis, Hans Plomp, Aja Waalwijk, Ruth Bader, Michael Kamp, Peter van der Wel, Rita Brakel, Gerben Hellinga. "The Doomed City of Doel"
Sadly, we have to announce that Ruth Bader died. She did most of our mailings, so we ask you to send further correspondence c/o symposium@ruigoord.nl. We also want to point out that one date mentioned in the first invitation was incorrect. The reception for guests will be on Monday the 22nd of July 2013 at around 17.00 o’clock (5 pm Amsterdam time). Questions: In view of sleeping arrangements, how many people will be coming with you and how long are you intending to stay? Could you tell us briefly what the topic of your presentation will be: will it have a theoretical or a practical focus? Here is a preliminary program, including some points of attention that we’d like you to address: Monday July 22nd: Formal Guest Reception. Tuesday July 23rd: The practice of free culture. Points of attention: Past, present, and future of the community: historical coincidence, geographical setting, development of internal politics and the relationship to the outside world, the problems and opportunities. Wednesday July 24th: The theory of free culture. Points of attention: What does free culture have to offer to society? Creating free space, temporary/permanent autonomous zones; colonization, encapsulation of free culture through governmental legislation. Thursday July 25th: opening of the Axis Mundi and the Christiania and North American embassies. The program will begin with livestream video of the national protests #23F, “Tide of citizens against the coup of the markets.” (This demonstration takes place on the anniversary of the attempted rightist coup d'état of 1981.) The livestream will tie together the living movement and the job of archiving it. Live on-site (en vivo), Juan Escourido currently teaching at U. Penn will introduce and moderate. Amy Roberts of the Occupy Wall Street archive group will present, and later respond. Byron Maher and others of the Archivo 15M assemblea (assembly the the 15th of May archive group) will make a slide presentation. (With luck, we will netcast from the Patio Maravillas social center in Madrid.) After the presentations, a question and answer, and exchange of ideas between the movements.